Home / Featured / News / pc / playstation / reviews / The Swords of Ditto Review. 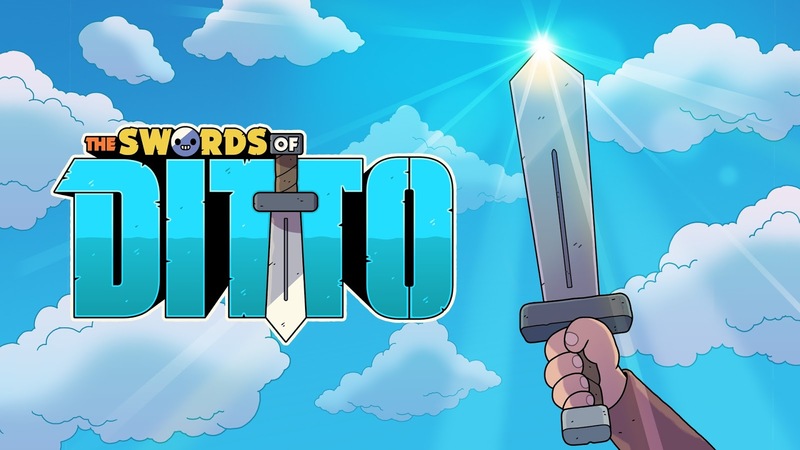 The Swords of Ditto Review. A new dungeon crawler brings a rogue-lite with a dash of groundhog day, a pinch of cuteness and Kazoo's. A strange voice wakes me up from a deep slumber. As I open my eyes the voice continuously urges me to get out of bed and go fulfill my destiny. Soon I find myself at a creepy graveyard where I retrieve a sword and am instantly transformed into a hero with a purpose. You see the world has been under the grueling rule of the witch Mormo for the past 100 years and it is time for her reign to end. The disembodied voice appears to be a dung beetle who is not concerned with being too helpful in sending me on my way. Standing here in this colorful town I cannot shake the feeling of deja-vu. The lay of the land is unfamiliar but the faces of its inhabitants feel all to familiar. 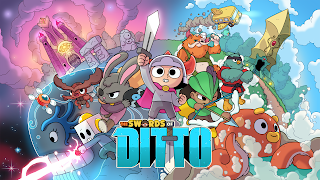 The Swords of Ditto is an action role playing game with some Rogue-like elements that in style and gameplay echo previous Zelda games blended with more recent games such as Rogue Legacy. You take control of a randomly created character when the game starts out as your run of the mill RPG, but it becomes clear quickly that it has some self awareness about what it is and makes fun of its own tutorial steps and at times lack of exposition on the story. Just go with it and as you play, more information will reveal itself. Each adventure you start features a unique experience with randomly generated over world and dungeons. You travel through the world and gain levels and upgrades as well as access to new abilities. As far as a top down action RPG goes, Swords of Ditto seems to be a straight up affair. You have a basic melee attack, a roll ability to avoid opponents and a quick access inventory mapped to the D-pad for easy access to your inventory. To regain health or rid yourself of elemental effects, you use a variety of food such as milk, donuts ,hotdogs etc. In addition to your sword you will come in the possession of other items called toys. These items use an energy called toy power and offer unique ways to deal with enemies or environmental challenges. Augmentations to your weapons are done with stickers. These stickers provided bonuses to your weapons, resistance against elements etc. As you level up you can place more stickers. There are also a few toys of legend that are to be found in dungeons only which will allow you to solve puzzles in other areas that hold “Anchors” placed by Mormo. Removing these anchors are optional, but it will make her substantially weaker when facing the final battle. What gives the game its own identity is the way that it works though cyclical progression. It seems it is not the hero wielding the sword who’s story you see unfold , but rather the story of the legendary sword itself. Mormo has been waiting a hundred years for the swords arrival and has run a bit out of patience, so you only have a certain amount of days (3, 4 or 7 in game time depending on difficulty) to prepare for your final battle with her. 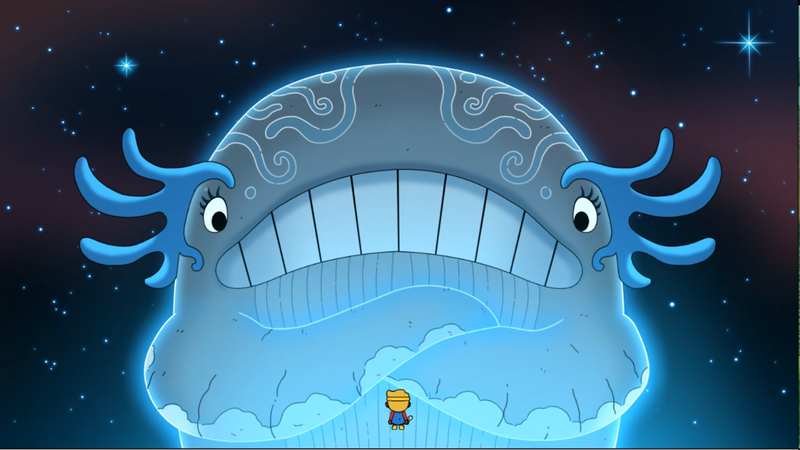 Even though it is possible to defeat Mormo on your first time playing, the chances this happens are very small. If you lose, the hero dies and a hundred years later a new hero will wield the sword in order to challenge Mormo in a new era, taking place in a new randomly generated version of Ditto. All you are able to keep is your earned XP, money, and the heroic sword. Many toys and augmentation stickers will have disappeared and the race against the clock starts again. It seems unfair in the beginning, as four days is just not enough to get everything done, even if time stops when you are in town or in a dungeon. But as you keep playing you will discover ways to slow down or reverse time, save up extra lives and more. Eventually you will even find ways to keep some of your upgrades through death for a price. The sense of growth in the game is what keeps you coming back for more and exploration is usually rewarded with money, items, XP and backstory fleshing out the game as you progress. I love me some air kazoo! As you level up, so do the monsters. Thus making it less likely to run into too big of a challenge by accident and be punished for it. You also do not outgrow certain areas keeping things challenging enough to prevent boredom. It is wise to stay methodical in your attacks, as it is easy to dive in too aggressively and be overwhelmed by Mormo’s minions and beasties forcing you to start a new character prematurely. The area around the town are randomly generated and are presented by squares on your main map, as you move through them. Some passageways are blocked and you will have to go around until you are able to unblock them. What I found a bit annoying is how easy the map moves to the next map if you get to close to the edge, causing me to miss some pickups along the way or having to backtrack because I was not ready to leave that part of the zone yet. With its random layout each time, things move around and it can take some time to find your way around with each new hero. To prevent a lot of travel time, the game allows you to travel by air kazoo bus. 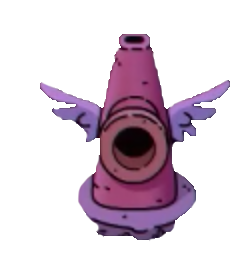 Giant kazoo checkpoints are scattered around the map. If you play on your personal kazoo, a bus appears to pick you up and drop you off elsewhere in an instant. Of course fast travel does mean you will miss out on potential XP. Busses and Portals ..Oh My! Dungeons are also randomly generated environments with various puzzles and traps to solve in order to get to a treasure at the end. These consist out of switches that shift realms, allowing you to pass through barriers to moving crystals and blocks. These puzzles are not the most difficult but varied enough to prevent them from feeling too repetitive. In my experience these dungeons do not reset if you leave them, allowing you to go into town and shop for new items if you need, and then return to the dungeon to finish its exploration. Luckily, time stops while you are in the dungeon so you do not have to feel rushed going through them. In some cases when entering a dungeon, game modifiers will be in effect, such as fire does not do damage, faster heath regeneration, etc. Throughout your many adventures you will encounter a large variety of characters who will bring new opportunities to improve your hero. Some will offer quests with rewards as well, if you can find the time to fulfill them. A pleasant surprise is the addition of co-op in the game. Just press any button on the other controller and you can share in the the adventure instead of passively looking. Inventory management and shopping is a bit cumbersome as you have to take turns, but as it is not a loot heavy game such as Diablo, this does not happen too often. Using the d-pad for quick item swapping also reduces the need to pause gameplay. For a little added fun, you can carry each other, as well as throw each other at enemies. Puzzle solving and attacking monsters becomes different due to the fact you can split up and flank your enemies. Pay attention when shopping and items though, as they are considered shared inventory. 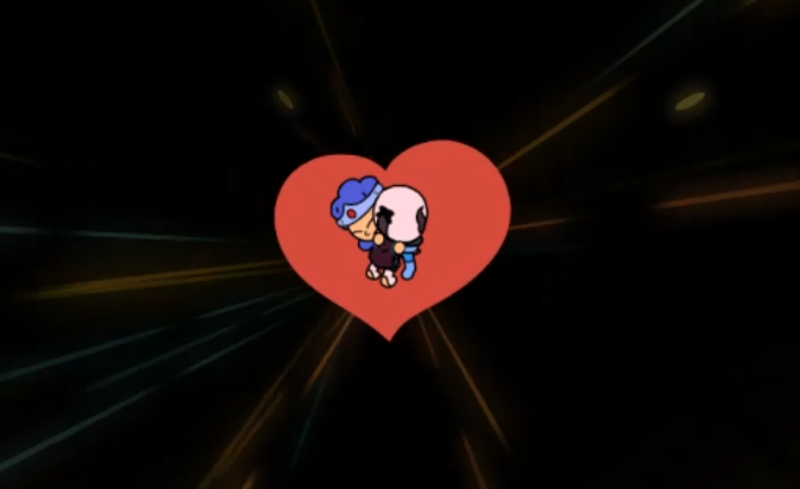 If one of you dies the other player can revive you with a hug. It will cost half of their life to do so however, it is a real aaawww moment to share. They made me a statue! The swords of Ditto has an adorable art style and has great color usage, which reminded us a lot of another in house favorite Costume Quest in many ways. 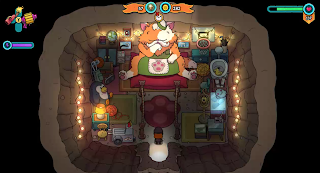 The animations are smooth and crisp with many unique designs in the game. Add to that, a great soundtrack that is pleasant to the ears and varied enough to not become too monotonous. There is a large variety of enemies with different attack patterns which need a particular approach, and when combined in an attack can offer some unique challenges on gameplay. Also, the colorful support cast of characters you run into as you progress in the game have great standout designs and bring life to the world of Ditto. 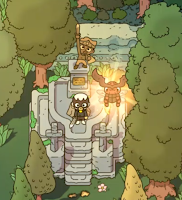 Small things that build the world such as a statue of your previously played hero or fighting a shadowy version of ones that failed before, are a fun addition to the world building as you play. The game does not hold your hand too much, other than in the beginning and at a few key moments. Other than that, it allows for exploration and discovery. The game is self aware of this, and the regular tropes in RPG’s and seems to self parody this on a regular basis during in game dialog. The interface and menus are easy to read and understand. While the use of candy, toys and stickers as in game items provide an attractive and unique style that is accessible for all ages. The game comes with an ESRB rating of E10+ ( everyone ten and up). Even though there is death in the game, from the monsters you defeat to the heroes that you lose through different attempts there is no blood, gore or scary moments. In fact there is low key humor involved throughout the game and even a few dung beetle poop jokes. The colorful cartoon style is used in earnest and not to mask some form of ultra violent game, as we sometimes see in other games. If the time pressure of the game is a bit too frustrating for younger players you can choose to play on an easier difficulty mode, which will expand the time to seven days and make the game play easier by making enemies weaker and the hero stronger. The coop works really well, making it fun to work together and makes the game a little easier. Do not forget about the shared resources though. The game is definitely family and kid friendly and should offer a good option to game together. 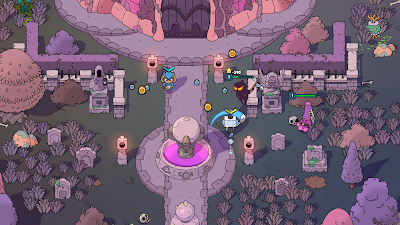 Despite its rogue like elements I found The Swords of Ditto a relaxing game to play. Once you understand that death and moving to new heroes is part of the game, you can stop worrying about it and focus on exploring and gaining experience. Over time you gain access to more powers such as time reversal, extra lives and transferring weapons beyond your death, making your next run through easier than the one before. It must be said that you get out of the game what you put in it. Explore, try new things, read some of the lore you find and speak to all the NPC’s, etc. You can finish the game on easy in 5-6 hours, but you can still play and discover new habitats of Ditto, new quests, new toys and new stickers 30 hours in. The core of the game play, is that it is a never ending loop of mini experiences to face alone or with a friend on a local couch co-op. Defeating Mormo is just one part of the game. Your actions, resulting in either victory or failure will leave an effect on the world for the next hero that wields the sword. Understanding that will enhance your enjoyment of this game. As it stands, The Swords of Ditto has us come back to it over and over again with a smile. Hopefully one day we will see a switch release of the game so that I can take it on the road with me. Now excuse me, it is time for some more hugs.